Sunny Suwanmethanon and Davika Hoorne in Heart Attack. The Skinny: Indie filmmaker Nawapol Thamrongrattanarit makes a major creative leap into the mainstream with this hilarious and painfully relatable comedy. Freelancing can be fatal in Heart Attack, the first mainstream feature by Thai indie wunderkind Nawapol Thamrongrattanarit. Fortunately, working under the now-defunct commercial conglomerate GTH didn’t diminish the quirky filmmaking sensibilities Thamrongrattanarit showed in experimental charmers 36 and Mary is Happy, Mary is Happy. The story of a freelance graphic designer who must choose between his work and his health, Heart Attack is by far the director’s most accessible film and a major creative leap for one of Thailand’s most promising young filmmakers. Thamrongrattanarit is no stranger to GTH’s blockbuster formulaic romcoms; he co-wrote two films and a segment in anthology Seven Something for the company before making his feature debut with 36. A glossy, polished commercial package with unrealistically pretty people, Heart Attack is a charming execution of the GTH formula, but it also turns the formula on its head in a way that makes it oddly subversive. Whereas 36 and Mary shared a thematic connection as stories about our relationship with the digital world, Heart Attack is a much more analog entity in comparison. Yoon (Sunny Suwanmethanont) is one of the most in-demand freelance graphic designers in town. Determined to keep his standing in the industry, Yoon spends his days and nights in front of his computer, and stays fuelled with a potentially lethal mix of Red Bull and coffee plus an occasional side of convenience store shrimp dumplings. Yoon is so desperate to meet his deadlines that he shows up at the funeral of his friend’s father and asks for the temple’s wi-fi password – a scene that is as hilarious as it is painfully cringe-worthy for any serious freelancer. After a six-day work streak without sleep, Yoon begins to develop a rash on his body. 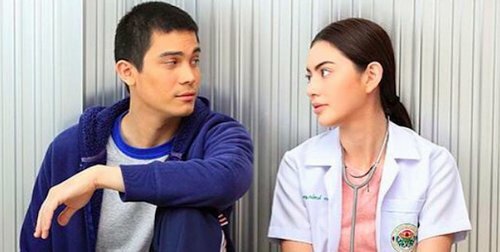 With no health insurance to pay for private clinic visits, Yoon goes to a public hospital, where he experiences a meet-cute with the gorgeous Dr. Imm (Davika Hoorne). Young and still idealistic about her ability to heal, Imm convinces Yoon to adopt a healthier lifestyle. But almost every one of the doctor’s demands – exercise, follow normal sleep hours, avoid seafood – seems impossible if Yoon is to complete his work on time. He tries to ignore her advice, but her friendly demeanor and his infatuation with her push him to commit to a new life. Soon enough, deadlines are missed and embarrassing mistakes are made. The rash does go away, but so do work opportunities. Heart Attack is a darkly comedic portrait of millennial workaholics who escaped the four walls of the office only to become even more socially isolated and exploited than ever. The film was reportedly based on the personal experiences of Thamrongrattanarit, who also directs ads and short films for clients, and his freelance artist friends, and it is absolutely spot-on in capturing freelancers’ constant anxiety over insane deadlines, vague client demands and intense competition. One character sums up the pressure of freelancing to Yoon perfectly: Freelancers must constantly deliver their best to clients in time because the word of a single screw-up can spread like wildfire and spell the end of a freelancer’s career. Even though Yoon and Imm’s relationship is a major catalyst of the story, Yoon’s professional life is the central focus of the film. Suwanmethanont and Hoorne only share a number of scenes together (the story is framed by Yoon’s monthly doctor visits), but those scenes have a sweet will-they-or-won’t-they anticipation that make us believe that Yoon might sacrifice his career to please Imm. Suwanmethanont instead shares the most scenes with former Voice of Thailand contestant Violette Wautier, who plays Yoon’s amusingly stoic agent and best friend Je. The typical GTH film would feature a romance between them, but Thamrongrattanarit throws any romantic notion between the two out the window by giving Je a devoted (and barely seen) boyfriend. Without sexual tension hanging over them, Yoon and Je’s friendship is actually the most poignant relationship in the film. Thamrongrattanarit’s most impressive feat in Heart Attack is roping the outlandish anecdotal humor of Mary is Happy, Mary is Happy into a traditional straightforward narrative. The absurdity of Yoon’s life is captured in a surrealistic verité style that can be described as Alfonso Cuaron meets Spike Jonze, using long handheld takes to play up the exhausting pace of Yoon’s constantly-at-work lifestyle. Nawapol also has a talent for capturing humor from everyday observations, particularly in Yoon’s voiceovers, which are used as hilarious commentary that complements the visuals rather than a lazy storytelling shortcut.